Yeah, but: It's 'Sport' in the 'SUV' sense. 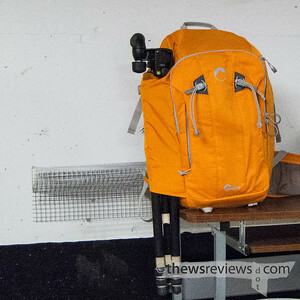 The Long Version: Let's be honest – I'm something of a brand snob, and Lowepro comes across as the Targus of the camera-bag world. It's widely available, a recognized maker of decent stuff that everyone starts out with, and they've built an empire with well-designed but uninspiring black nylon bags. So I haven't paid much attention to what Lowepro has been up to recently, which is probably why their recent products have knocked my socks off. This is entirely my fault. 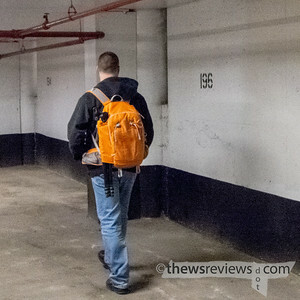 I've recently come into possession of the brand-new Lowepro Flipside Sport 20L. 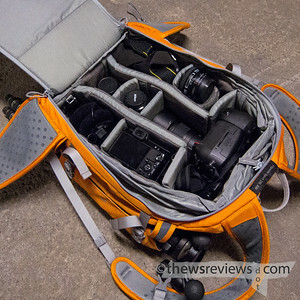 It's an awesome bag that joins the smaller 10 and 15-litre capacity Flipside Sport series; the whole family combines and builds on the ideas of the Photo Sport and original Flipside series, which are pretty impressive in their own rights. There's a lot of experience and thought behind this bag. All of the Flipsides are 'system' bags that are designed to hold lots of gear without the large other-stuff compartment that multi-use camera backpacks have. The 20L Sport is voluminous without being overly bulky; it can carry my F5 or D800 with grip attached quite comfortably, even when one has a lens on it. None of my many other backpacks can do that, even when they take up the same amount of room on the bus. The broader 'Flipside' design ethos is for a high-security pack that opens from the back, with only minimal exterior pockets. The Sport model distinguishes itself with an interesting tripod attachment method, trekking pole holders, ventilated shoulder straps, and the ability to hold a sold-separately hydration bladder. And, of course, it's available in orange. The Flipside Sport 20L is not quite as spartan as the smaller 10L and 15L models. 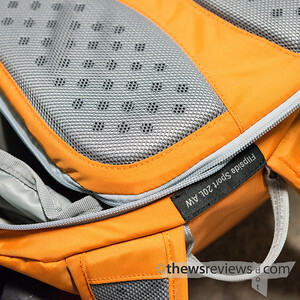 Most significantly, the 20L adds several layers of pockets to the front of the bag. Two of them are flat pockets with side zippers that can expand somewhat, and even the smaller one can hold a paperback-book-sized object. They don't have any internal dividers or organizers, however, which is something of a missed opportunity. The third pocket, which opens across the top of the bag, is a 'storage panel' that's inherited from the standard Flipside 400 and 500 models. 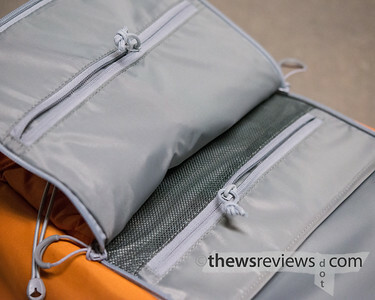 It's much more substantial than the side-zippered pockets, and has several interior organizing sub-pockets. It's still sized for things that are mostly flat, but one section is padded and big enough to protect a tablet or 11" Macbook Air. I have to confess that I feel like a bit of a genius for buying that diminutive computer, because it fits in all kinds of surprising places. There are also two flat pockets inside the bag, one in the storage panel and the other inside the camera compartment, that are zippered and perfect for storing passports and travel documents. Very handy. It's not limitless, but there's a lot of space in this bag. The photo above includes my D800 with grip and 60/2.8G macro lens attached, V1 with 30-110 attached, F5, 85/1.8D, and Sony 7506 headphones each in their own compartments; the 1-system 10-30mm and 18.5mm lenses share a compartment, as do the Nikon 50mm 1.4G and 1.4D lenses. There's room in the front pockets for my laptop and audio recorder that completes my setup, or I could easily swap something out to carry the bulky GA645zi medium format camera as well. If I'm not careful I can easily make this bag too heavy to carry comfortably, so I let that be my guide when I'm packing it for an outing. And no, I don't think it's odd to concurrently own and use both Nikon 50/1.4 lenses. Increasing the Flipside Sport's flexibility even more is that the entire padded camera compartment is removable, and even comes with its own drawstringed dust cover and handles to facilitate the process. So in a matter of seconds the bag goes from carrying a billion dollars of equipment to being a spacious and free-spirited daypack. I wouldn't plan for that as the bags' main use, but it's a nice option for unexpected contingencies. 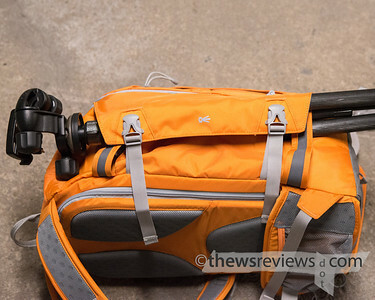 The Flipside Sport's tripod attachment method is unorthodox but clever. Instead of the usual cup-the-feet and lash-the-top method, there are two heavy-duty bands that the tripod straddles, broad fabric flaps that cover them, and two webbing-and-buckle straps that secure everything in place. This holds the tripod very solidly without the usual wobble, covers the attachment points to stop it from snagging on branches and whatnot, and is fairly easy to use. This attachment method can even simultaneously hold my Joby Gorillapod Focus and the shockmount system for my audio recorder, which a more typical tripod carrying method wouldn't permit. It's also a place to hold a sweater or jacket, which simply wouldn't fit anywhere else. Monopods are a bit more of a challenge, but could work as long as they have a head or platform to catch on the top of the support bands. Another nice detail is that the grey accents on the bag really are grey. The various straps and fabrics don't give identical White Balance eyedropper values, and don't quite match my WhiBal card, which doesn't match Ezybalance, which also doesn't quite match my Passport – my point being that white balancing is always something of an approximation anyway. Sometimes "close enough" is good enough, and that's what we have here. The readings for horrible fluorescent lighting that I took these pictures under varied by only 50-100K, with just a few points difference on the green-magenta bias, both from various greys on the bag and my WhiBal card. That's good enough for me. Of course, I can't attest to its consistency under different light sources, so as always I recommend testing it for yourself under field conditions before relying on any backpack as a white balance reference. The non-tripod side of the Flipside Sport has the pocket for a water bladder, but despite its height and expandable pleat it's strangely useless for anything else. It doesn't hold nearly as much as it looks like it should, but if it can't zip closed then there's a webbing strap that can hold things in place. And there's nothing that stops it from being the world's largest MP3 player pocket, either. The non-removable waist belt has lightly padded sides with mesh pockets, but these pockets have elastic tops instead of the zippers of the Photo Sport series. They might be handy for temporarily stashing snacks or lens caps, but I'd never trust my phone or compact camera in one. Ultimately the waist belt is my biggest disappointment with the bag, since it's not much better than a simple webbing strap, and yet it's not removable for the times when it's not needed. A good removable belt would be ideal, such as the one on my Kata 261PL 'Source', but I'd even prefer a simple removable webbing strap to the built-in one. 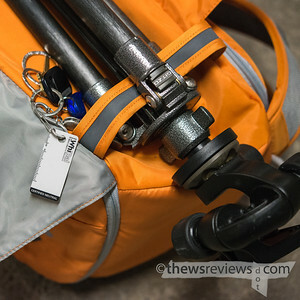 All of the Flipside Sports come with Lowepro's tethered All Weather cover. The back-panel access means that the camera compartment is already well-protected against rain and snow, but it also means that the camera compartment can be reached even when the AW cover is in place. So the cover is less necessary for its intended purpose, but is incredibly useful to protect the bag from dirty or damp surfaces when it's set down. I'd call that a win-win situation. Something to add to the Flipside Sport is a little 'toiletries bag' that can aggregate and organize small incidentals. My Stealth Reporter 200 came with one, and after I stopped scoffing at the idea it turned out to be incredibly useful. It takes up a lens compartment, but is a great way to hold spare batteries, cable releases, film, earplugs, pill bottles, wireless remotes, earphones, housekeys, and all of life's other little necessities. 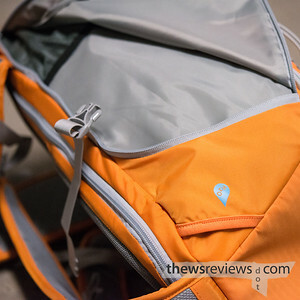 The 20L is so large that losing a lens slot isn't a big deal, so it's a useful addition to a bag that lacks spacious everything-else pockets. Highly recommended. Having the 20L Flipside Sport in my vast collection of camera bags is important to me. It's the only bag that can carry all three of my Nikon systems and favourite lenses, making it perfect for my brief but gear-heavy summer excursions to exotic places like the Leslie Street Spit. Assuming the ever-evolving carry-on regulations permit it, it would also be my choice for cross-continent trips when I'm able to carry a second bag for trivialities like a few changes of clothing. No, it wouldn't be my first choice for small street shooting kit, but it's a solid landscapists' working bag and it moves gear like nothing else. Here's the funny thing: I like the Flipside Sport 20L so much that I spent weeks thinking about adding the Photo Sport 200 to my collection as well. That bag is a perfect compliment to the Flipside Sport, being a skinny little thing that's biased towards quick access to only a small amount of camera gear with lots of room for carrying non-photographic essentials. Ultimately I decided that I wanted something a little more urban than technical, and added a different Lowepro backpack to the family instead, and now it's my everyday-carry compliment to the more specialized Flipside Sport. If anyone's interested in buying a lightly used Kata 3N1-22, let me know.